Blackbird Presents is at it again planning another huge tribute for a country legend, and this one might be the biggest of them all. 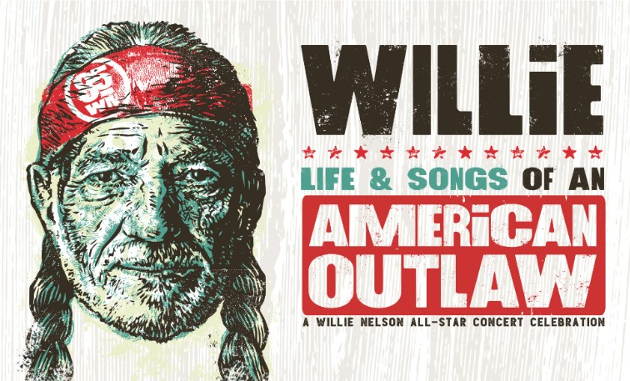 Often working with Willie Nelson via tributes to others, as well as his multi-city “Outlaw Fest” tours each summer, now Blackbird Presents is putting together a tribute for Willie himself called “Willie: Life and Songs of an American Outlaw,” set to transpire in Nashville at the Bridgestone Arena on Saturday, January 12th, 2019. Performers announced so far include Willie Nelson, George Strait, Vince Gill, Alison Krauss, The Avett Brothers, John Mellencamp, Kris Kristofferson, Lee Ann Womack, Lyle Lovett, Norah Jones and The Little Willies, Sheryl Crow, Jack Johnson, and Susan Tedeschi & Derek Trucks. More performers and special appearances will be announced closer to the event (as they always are), so don’t get too jumpy about who is not included just yet. And unlike some of the other tributes they’ve done for folks like Kris Kristofferson, Emmylou Harris, Kenny Rogers, and Waylon Jennings, this one is promised to be televised. It’s expected to be broadcast on A&E at some point in 2019 on a date to be named later. Tickets go on sale Monday, November 12, 2018 at 10 a.m. Central online at Livenation.com, by phone at 800-745-3000, and the Bridgestone Arena box office. This event will sell out. Why is Sheryl Crow always involved in these sorts of things? And Buddy Miller leading the house band. I was at the Emmylou show.and while I was glad I went I have no interest in any others especially considering the price. The problem is that the constant setup and takedown between artists really hurts any momentum that builds. Lots of dead time. I’d be thrilled to see Buddy Miller anytime. The Avett Brothers should be on everyone’s speed dial. Best band to ever walk the face of the Earth. Never could get into that band myself. Not enough edge for me. Yeah, Trig is spot on. Sheryl Crow is not country music, really has never been but she’s always popping up. There are plenty of worthy females that should be invited over her. JJ is a decent choice. Avett Bros for some reason are always getting invited. They seem to be more Americana than country to me. But the event isn’t being billed as a country music event, it’s simply a tribute to Willie. I think in general, the Blackbird presents events are coming from a good place. They are a nice alternative to the horrors we see at many other events. Nice to see George Strait on the list. He’s always a class act. Should be a good night! willie isnt strictly country music either kev. Because she’s a total babe. Willie has done a few songs with Sheryl Crow, and I believe she is also involved with Farm Aid. They should hold this in a state where Willie’s Reserve is available for purchase! Wonder if DAC will be invited? I don’t know… the sum never equals the parts with these kind of tribute concerts. They are clunky and unfulfilling… I’ll pass. Tyler Childers is going to be opening act for a Willie show..that’s great..Willie will like Tyler..I know Tyler likes Willie..they should get along fine..cut from the same clothe..Tyler should be at the willie tribute also.. He does a killer cover of Time of the Preacher. Along with Colter Wall’s cover of Red Headed Stranger, they’re the two best Willie covers I’ve heard. In have never thought of Willie Nelson as a country artist just an artist and the best darn artist there is I doesn’t matter what style of music we are talking about Willie Nelson is the best. Most of the performers who come immediately to mind when I think Willie tribute are, unfortunately, gone. Would love to meet Willie in person, but that seams impossible, so have a great tribute to Willie . Hopefully more entertainers to be added, I agree that Toby Keith and Scotty Emerick need to be there. Plus Dolly and Miranda. and his son Lukas and daughter Paula. Happy this will be televised at some point. Really in early Jan…lots of names could be available…Like Bob Dylan, maybe…lets hope..